A Muslim, also spelled Moslem, is an adherent of Islam, a monotheistic Abrahamic religion based on the Qur'an—which Muslims consider the verbatim word of "God", or "Allah", as revealed to "prophet" Muhammad—and, with lesser authority than the Qur'an, the teachings and practices of Muhammad as recorded in traditional accounts, called hadith. "Muslim" is an Arabic word meaning "one who submits to God". A Muslim or Moslem is a follower of Islam. It means someone who is "submissive to the will of Allah". The Muslim faith incorporates honoring the Shahada, both submitting to the will of Allah and accepting the "prophet" Muhammad as his apostle. The older terms "Mohammedan", "Muhammedan" or "mohammedanism" ("follower of Muhammad"), are generally considered as offensive to Muslims and has mostly fallen out of use. An email: "About "Muhammadanism". This term is not just "offensive", it is regarded as inacceptable in Islam. Muhammadanism suggests a religion based on what Muhammad (Peace be upon him) supposedly "said in the Qur'an", but it is not Muhammad (PBUH) who spoke, it was Allah (God), and only He was the One Who sent down the Qur'an (Or Koran). There is one Surah (Chapter) in the Qur'an which emphasises the importance of this. Replacing "Muhammadanism" with "Islam" is really the best thing to do, because never has there been an Islamic scholar which used this term to describe Islam, it has no valid ground. Moreover, Islam means "Submission to God", and this term is MUCH more appropriate than a term based on a human's name. (Note; It IS required in Islam to strive to be as Muhammad (PBUH), for he was the personification of the Qur'an! Next to the Qur'an, there is a book called the Sunnah, which contains sayings, acts, and words and acts of approval of the Prophet (PBUH). P.S. you might ask yourself what value the (Peace be upon Him) means after the name Muhammad (PBUH). It is what Muslims say whenever the Prophet's (PBUH) name is mentioned. The actual Arabic words, from which this was translated mean; May the mercy and peace of God be upon him." Contrary to the claims of the e-mailer, as we will see, Mohammedanism is indeed a man made religion "based on what Muhammad supposedly said in the Qur'an", because if the Qur'an originated from God as Muslims claim, then He contradicted Himself – which is impossible – since He clearly said in His previous true Revelation, the Bible, that He had a Son, Jesus Christ (Isaiah 9:6; Matthew 3:17; Matthew 17:5; Mark 1:11; Mark 9:7; Luke 3:22; Luke 9:35; 2 Peter 1:17), but God apparently later changed His mind—according to the Qur'an and the Muslims. Muslims teach that the Qur'an (c. 610 – 632 AD) is the final authority and the last revelation of Allah. The Bible, however, was completed in the first century with the Book of Revelation. Muslims maintain that previous messages and revelations have been partially changed or corrupted over time, but consider the Qur'an to be both the unaltered and the final revelation of God. Islam's claim that the Bible somehow has been corrupted over time but their own book remained unchanged is indeed quite illogical and false, but perhaps not surprising. They must say something to excuse themselves and their "holy" books stark departure from God's true revelation, the Bible, mustn't they? Muslims consider Jesus to be a prophet, but deny that He was God. They say that God had no Son and repudiate the Trinity. They say the Bible is not true and that God "changed" His mind about the Bible when He some 600 years later contradicted Himself with the "new" teachings of the Qur'an—but God change not (Malachi 3:6). The Bible warns against anyone adding to or subtracting from God's Word (Deuteronomy 4:2; Proverbs 30:6; Galatians 1:6-12; Revelation 22:18). The Qur'an, as a claimed addition to God's Word, directly disobeys God's command. The true religion cannot have blatant illogic at the heart of its teaching. Islam has blatant illogic at its heart. The illogic is this: Jesus said and indicated that He was God many times (e.g., John 8:58). On this point one can also consult: Where does the Bible teach that Jesus is God? If He was not God (as Muslims say), then He was a false prophet for claiming to be God when He was not. According to Muslims, he would logically – and we say this for the sake of argument for those who, God forbid, might accept Islam as true – have to be considered a blasphemer and a false prophet. He could not logically be considered a prophet. That proves that the Muslim religion is a false religion and that it has an official teaching which is blatantly false and illogical. It proves it without even getting into the other false teachings of Islam which demonstrate that it's a false religion which was inspired by the enemy of mankind to lead souls astray. One and a half billion people (more than one fifth of the world's population) from a vast range of nationalities and cultures across the globe - from the southern Philippines to the western coast of Africa - consider themselves as Muslims. Of these, about eighteen percent live in the Arab world. The world's largest Muslim community is in Indonesia, and substantial parts of Asia and much of Africa are Muslim, while significant minorities are to be found in what used to be called the Soviet Union, as well as China, North and South America, Europe and Oceania. For Muslims, Islam is both a "religion" and a "complete way of life". 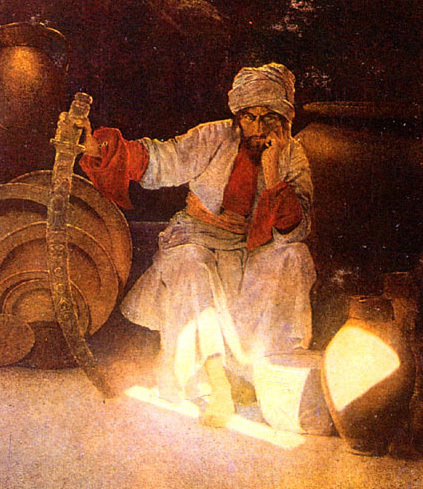 A Muslim, also spelled Moslem, is an adherent of Islam, a monotheistic Abrahamic religion based on the Qur'an—which Muslims consider the verbatim word of God as revealed to "prophet" Muhammad—and, with lesser authority than the Qur'an, the teachings and practices of Muhammad as recorded in traditional accounts, called hadith. "Muslim" is an Arabic word meaning "one who submits to God". Most Muslims accept as a Muslim anyone who has publicly pronounced the Shahadah (declaration of faith) which states, "I testify that there is no god except for the God ["Allah"], and I testify that Muhammad is the Messenger of God." Their basic religious practices are enumerated in the Five Pillars of Islam, which, in addition to Shahadah, consist of daily prayers (salat), fasting during Ramadan (sawm), almsgiving (zakat), and the pilgrimage to Mecca (hajj) at least once in a lifetime. Currently, the most up-to-date reports from an American think tank and PBS have estimated 1.2 to 1.57 billion Muslims populate the world, or about 20% of an estimated 2009 world population of 6.8 billion. One of the big arguments for Islam is its rapid spread. Muslims argue that because their religion grew so quickly over the globe, it must have been guided by Allah. However, many religions and philosophies have grown quickly over the world in the past. Early on, Christianity spread from Norway and Russia in the north to North Africa and Ethiopia in the south and from Spain in the west to India in the east. Then, when the New World was discovered, the continents of North and South America quickly became populated by Christians. Now, "Christianity" is still the fastest growing religion in terms of converts! Communism spread from Russia to China, Korea, Vietnam, Cambodia, Cuba, Central Africa, Eastern Europe, and South America. All this happened within 80 years! If the rate of spread of a religion or philosophy is any indicator of the truth of a religion, then Islam will have to take 3rd place! "Mr. Morey also claims that Muhammad forced people to give up their idols and accept Islam. This statement is not true. What Muhammad did was give a choice to the pagans and idol worshippers to either give up their idols or die. No force was used, just a choice. If you believe your idols, then are you willing to die for them is the question that was faced. I put this question to Mr. Morey and his readers: Are you willing to die for your belief in Jesus Christ?" -Waliyyuddin Shareef, In Response to Robert Morey's Islamic Invasion, p.35. The next thing that they did was to punish anyone who wanted to convert from Islam with death (Sura 4:88-89). So, the masses of Muslims all over the world were and still are kept captive from even thinking about changing religions by the barbaric Islamic fundamentalist hordes of their own nations. This has created nominal Muslims (i.e. Muslim in-name-only) on a grand scale! The reason for the rapid growth of Islam today is the high birth rate of Islamic families. When most Islamic families around the world are impoverished and their men are allowed to have up to four wives and they rarely use contraception or abort their babies (contrary to most people in the so-called "Christian" nations who most of them use some form or another of artificial birth control, contraception or NFP), the high rate of growth is understandable. Also because these families are poor and sometimes cannot afford all of their children, they sometimes send them away to Europe where the welfare states take care of them. In terms of converts, Islam is dying. One Muslim "religious" leader even admitted that Islam was dying in Africa because people were converting to so-called Christianity at a higher rate than Muslims could be born! Unfortunately, most Muslims in other countries do not have such an opportunity. In countries like Saudi Arabia and Pakistan, missionaries who attempt to convert people from Islam are executed, and Muslims are afraid of leaving Islam because the penalty is death. Muslims in Britain and Europe are afraid of leaving Islam because their families might do an 'honor killing' (i.e. murder for leaving Islam). Tragically, it happens frequently. Compared to Christianity, Islam has some similarities but significant differences. Like Christianity, Islam is monotheistic. However, Muslims reject the Trinity—that God has revealed Himself as one in three Persons: the Father, Son, and Holy Spirit. While each Person of the Trinity is fully God, God is not three gods but three in one. Muslims claim that Jesus was a mere prophet—not God's Son. Islam asserts that Jesus, though born of a virgin, was created like Adam. Many Muslims do not believe Jesus died on the cross. They do not understand why Allah would allow His prophet Isa (the Islamic word for "Jesus") to die a torturous death. Yet the Bible shows how the death of the perfect Son of God was essential to pay for the sins of believers (Isaiah 53:5-6; John 3:16; 14:6; 1 Peter 2:24). The Bible teaches that God's Son came in the form of man, a truth called the incarnation (Luke 1:30-35; John 1:14; Colossians 2:9; 1 John 4:1-3). The Lord Jesus Christ conquered the penalty and power of sin by dying on the cross (Romans 6:23). After rising from the dead, Jesus went back to Heaven to be with His Father and sent the Holy Spirit to believers (Acts 1:8-11). One day, Christ will return to judge and rule (Acts 10:42; 43). Those who have trusted in the Lord Jesus will live with Him, but those who refuse to follow Him must be separated in Hell from the Holy God. "The Father loves the Son and has given all things into his hand. Whoever believes in the Son has eternal life; whoever does not obey the Son shall not see life, but the wrath of God remains on him" (John 3:35-36). Either Jesus bears the wrath of God for your sin on the cross or you bear the wrath of God for your sin in Hell (1 Peter 2:24). The Trinity is essential to the Christian faith. Without the Trinity, there would be no incarnation of God's Son in the Person of Jesus Christ. Without Jesus Christ, there would be no salvation from sin. Without salvation, sin would condemn all to an eternal Hell. Do Christians and Muslims worship the same God? To this question, the answer is definitely no. Because of crucial differences between the Christian and Muslim concepts of God, the two faiths cannot both be true. The biblical God alone addresses and solves the problem of sin by giving His Son. Because of these essential differences and contradictions, Islam and Christianity cannot both be true. The Bible and Qur'an cannot both be God's Word. The truth has eternal consequences. "Beloved, do not believe every spirit, but test the spirits to see whether they are from God, because many false prophets have gone out into the world. By this you know the Spirit of God: every spirit that confesses that Jesus Christ has come in the flesh is from God; and every spirit that does not confess Jesus is not from God; this is the spirit of the antichrist, of which you have heard that it is coming, and now it is already in the world" (1 John 4:1-4; see also John 3:35-36). Answer: People often follow the religion of their parents or culture, whether Muslim, Buddhist, or Protestant. But when we stand before God on Judgment Day, each person must give account for himself—whether he believed in God's truth. But among so many religions, what is the truth? "Jesus answered, 'I am the way and the truth and the life. No one comes to the Father except through me'" (John 14:6). True Christians are followers of Jesus. How could Jesus claim to be the one and only way to God the Father? Let's find out in the Scripture, the Bible. The Bible records how Jesus fulfilled prophecy when He was born to the virgin Mary. He grew up unique from any other human because He never sinned (1 Peter 2:22). Crowds flocked to hear His teaching and marvel at His miracles. Jesus healed the sick, raised the dead, and walked on water. Of all people, Jesus did not deserve to die. Yet Jesus prophesied that He would be crucified and raised from the dead (Matthew 20:18-19). His words came to pass. Soldiers beat Jesus and put a crown of thorns on His head; people mocked and spit on Him; nails pierced His hands and feet into a wooden cross. Jesus had the power to save Himself, but He gave Himself, willingly dying on the cross (John 19:30). Three days later, Jesus rose from the grave! As a Muslim, you may ask, "Why would Allah allow His Prophet Isa to be mistreated and killed?" Jesus' death was essential because . . .
• Every person is a sinner: "For all have sinned and fall short of the glory of God" (Romans 3:23). Whether dishonoring parents, telling a lie, failing to love God best, or disbelieving God's Word, we each have sinned against the holy God. • The punishment for sin is death: "For the wages of sin is death" (Romans 6:23a). God pours out His wrath against unbelieving sinners by separating them forever in Hell (2 Thessalonians 1:8; 9). As the just Judge, God will not overlook sin. • We cannot save ourselves by good works without first having the true faith: "For it is by grace you have been saved, through faith—and this not from yourselves, it is the gift of God" (Ephesians 2:8-9). Faith is the beginning, foundation, and root of justification, and the first of all other virtues, without which it is impossible to please God. • God sacrificed His Son for sinners: "For God so loved the world that he gave his one and only Son, that whoever believes in him shall not perish but have eternal life" (John 3:16). God knew mankind's sin kept them from Heaven. God knew the only way the sin debt could be paid was by a perfect One paying the price of death. God knew He alone could pay such an infinite price. So God's eternal plan was to send His Son Jesus to die in the believing sinner's place. As a Muslim, you may say, "Oh, I believe in Jesus. I believe Isa was a true teacher, a great prophet, and a good man." But you are not baptized, nor have you entered the one and only true Church founded by Jesus Christ on St. Peter; and you cannot say Jesus was a true teacher and yet deny His teaching that He is the only way, truth, and life (John 14:6). You cannot believe Jesus was a great prophet and yet reject His prophecy that He would die and rise again in three days (Luke 18:31-33). You cannot admit Jesus is a good man yet disbelieve His claim to be the Son of God (Luke 22:70; John 5:18-47). You cannot consider becoming a Christian without realizing that Christianity excludes all other religions (Acts 4:12). The inescapable conclusion of Christianity is this: either Jesus bears your sin on the cross or you bear your sin in Hell. "Whoever believes in the Son has eternal life, but whoever rejects the Son will not see life, for God's wrath remains on him" (John 3:36). As you search the Bible (a Catholic Bible), may God awaken your heart to turn from your sin and trust in Jesus. You may respond with a prayer like the one below. Remember, the prayer does not save you. God alone can save! But the prayer may be your expression of the faith God gives you in the Lord Jesus Christ. "Dear God, I grieve that I have sinned against You. As a sinner, I'm worthy of death in Hell. But I believe You sent Your Son, Jesus, to die on the cross for sin and rise from the dead in victory. I now turn from following my own sinful desires and from trying to reach Heaven through my own will. I trust alone in the Lord Jesus alone as my Savior from sin. I love You my Lord, and submit myself to follow You by Your Church and Word, the Bible. Amen!"